This charming 3-bedroom waterfront cottage is affectionately known as, "TEENY HOUSE." It was named by a 2-year old many years ago! Designed by a prominent architect, the house is absolutely charming throughout. Every room is interesting and most rooms provide outstanding views across the sparkling waters of Caulk Cove. All rooms have beautiful wood floors. The comfortable family room has beaded wood ceilings, built-in book shelves and a free-standing wood stove, all of which contribute toward the cottage ambiance. Modern kitchen w/quartz counters, island with 2nd prep sink and KitchenAid stainless appliances. Two modern bathrooms, one up and one down. Downstairs TV/sitting room. Downstairs bedroom. Two bedrooms upstairs, both of which have cathedral ceilings. The main upstairs bedroom has French doors, leading to a covered balcony, where you can relax and enjoy fabulous sunset views across the water. The 6 acre property is further improved with a substantial 3-bay carriage house with a full bath and a spacious, climate controlled room above. That 20' x 30' ft. room has a small kitchenette and could be used for many purposes...guest quarters; office; art studio; game/exercise room. One of the three bays is a partitioned 18' x 30' room with a 20' ceiling, currently set up as a fantastic wood-working shop. That space would also support an automobile lift. The lighted 150' dock w/water, electric and a floating dock provides nearly 5' MLW. Caulk Cove is a beautiful, scenic tributary, ideal for crabbing, canoeing and kayaking. In fact, several kayaks, a row boat and canoes are included. 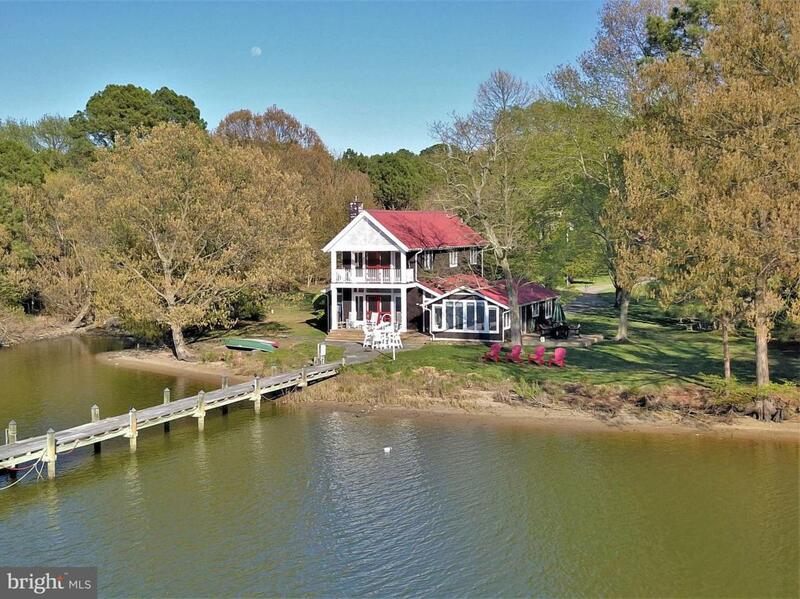 If you have a bigger boat, Tilghman Island, Oxford and some of the best fishing grounds on the Chesapeake Bay are a short, scenic cruise away.